I have a plethora of books which I’ve finished in recent months and would like to ‘catch-up’ on some reviews. So here is the first of about 6 or 7 that I hope to post over the coming weeks. Hold me to it! Recently I viewed a video teaching in which one theologian made a humourous remark about N.T. Wright having now published more books than he himself has read. It seems that Wright does churn out one book per year (or more? ), with his new one being released in a week’s time, How God Became King: The Forgotten Story of the Gospels. But a few months back, I purchased a copy of one of Tom Wright’s earlier works from 15 years ago. That book was not about Jesus and the Gospels, but about Paul – What Saint Paul Really Said: Was Paul of Tarsus the Real Founder of Christianity? The book stands within a long line of works on Pauline studies that has come out over the past century. And that is just how Wright begins the book – looking at specific writings on Pauline studies from the past 100 years, including such people as Albert Schweitzer, Rudolph Bultmann, W.D. Davies, Ernst Käsemann and E.P. Sanders. Wright lays out the questions and perspectives that each of these men have brought to the table as they tried to grasp the teaching of the greatest convert to Christ in the history of mankind. This, of course, laid the groundwork for Wright to jump in and make his own contribution, one that has normally been identified within the framework of the ‘new’ Pauline perspective. Chapter 2 lays out a kind of biographical background to understanding not only the mind of Paul, but first century Jews in general within the context of second temple period Judaism. If we want to understand Paul, at least in the sense of what Paul taught within his own framework, the idea is that we need to get inside the heart and mind of the Jewish people of that day, rather than get inside Martin Luther’s or John Wesley’s or whomever’s heart and mind of a different day. Such challenges to our present understanding of the gospel have spurred on other theologians today such as Scot McKnight in his The King Jesus Gospel and J.R. Daniel Kirk in his Jesus I Have Loved, But Paul? All of these writers have had and are giving a significant voice to understanding Paul both within an historical narrative reading of the New Testament and how such an approach can help us in our present world today. God’s gospel concerning his Son. A message about God – the one true God, the God who inspired the prophets – consisting in a message about Jesus. A story – a true story – about a human life, death and resurrection through which the living God becomes king of the world. A message which had grasped Paul and, through his work, would mushroom out to all the nations. That is Paul’s shorthand summary of what ‘the gospel’ actually is. But where the cross and/or resurrection? Tom Wright proceeds to show how these two all-important events are extremely critical in announcing the good news that Jesus Christ is King, is Lord. Though, interestingly enough, Wright also makes the connection point between Israel’s return from exile and resurrection. Though many of the Jewish people of the first century were in the land and saw the temple, they still believed they were in exile, captive to the rule of another king. Hence, with the resurrection of Messiah and proclamation that Jesus is Caesar-Lord, Israel was now being released from exile into the full promises of God. The next segment, ch. 4, looks at Paul’s thoughts on Jesus, mainly looking at the question of whether Paul believed Jesus to be divine. Wright takes time to show how varying Pauline passages do strongly support a case for the divinity of Jesus (i.e. 1 Cor 8:6; Phil 2:5-11; Col 1:15-20; etc). Wright also notes discussions surrounding the phrase ‘Son of God’. Whereas, in our evangelical theology of today, this term means something like ‘God the Son’ or ‘Second Person of the Trinity’, this was actually a term that first spoke of Israel or Israel’s king, but was now being employed with Jesus in declaring him to be God’s true Messiah-King. Still, the great relationship between the Father and Jesus, the Son, is shown through Paul’s employment of the title, Kyrios (or Lord), for Jesus. There are quite a few Jewish divine overtones in utilising this all-important title. And it is used extensively in reference to Jesus, the Messiah. He also briefly discusses the divine nature of the Spirit as well. Moving on into chs. 6-7, here is where we get into discussion around justification and the righteousness of God. Wright weighs in with some of his ‘new’ perspective thoughts (though this terminology of ‘new’ is a bit of a misnomer). And, as usual, Wright looks to weigh these terms within the Jewish context, rather than within an early 15th century protestation of the Roman Catholic Church and some of its specific doctrines. In summary, justification is, firstly, not the gospel itself. Secondly, Wright challenges the notion of imputation and sees our justification not about God giving or ‘breathing’ his righteousness into his people, as if we now have this entity within us. When one is declared right by the judge, one doesn’t get the judge’s own righteousness. Rather justification is a legal declaration of our status or standing before God, the judge, because of the work of Christ. We are now justified or declared faithful to the covenant of God. And the concept of God’s righteousness is all about God being faithful to his covenant promises. To say the least, in exegeting and engaging with particular passages, it is challenging to think that our concept of imputation is not found within certain passages, i.e., 2 Cor 5:21 as the biggie. But Wright takes the time to look at many major passages that typically fall under the reformation ideology of God’s (or Christ’s) righteousness being imputed to us. I also appreciate his discussion around present justification, on the basis of faith, and future justification, on the basis on one’s entire life (which will be in line with the present state of justification by faith in Christ). This future aspect would be found in passages like Rom 2:14-16. Chapter 8, entitled God’s Renewed Humanity, looks briefly at such topics as addressed in his later work, Surprised by Hope: Rethinking Heaven, the Resurrection and the Mission of the Church. It is, no doubt, a very ‘practical’ chapter on our response of worship, holiness, love and mission as God’s renewed people in Christ. N.T. Wright then turns to consider how Paul’s teachings on the gospel and justification can become important for the church today. How do we practically employ these terms in the church of our current day, which for him was heading in to the 21st century, with us now being here for over a decade? His final chapter, ch. 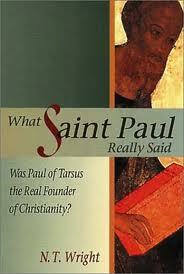 10, deals with the somewhat odd question in the subtitle of this book: Was Paul actually the founder of Christianity? He does so by building on what he has already put forth in prior pages, as well as by critiquing A.N. Wilson’s portrait of Paul in Paul: The Mind of the Apostle. And, of course, Wright could not agree with any notion that Paul started what Christ himself ‘began’, or continued within the covenant purposes of God. Rather, Paul was subservient to, a servant of, Jesus, God’s Messiah-King. In closing, it is worth noting that plenty of people read (or listen to) N.T. Wright today. Matter of fact, it would be quite difficult for any biblical studies student to not engage with him on some level. Having said that, it is also worth commenting that Wright is somewhat like Marmite (if you know what that is). What I mean is that one either loves him or hates him. There is not too much in between. But, whether one likes him, or his theology (as I do), or dislikes his theological approach, one does need to recognise that Tom Wright stands within a line of great New Testament scholars, contributing much to the table of both Jesus and Pauline studies. This book, as with just about everything he pens, carries that kind of weight into New Testament biblical scholarship. This entry was tagged N.T. Wright, new Pauline perspective, New Testament, Paul. Bookmark the permalink. I have read my share of Tom Wright, but the only three books I still have are his: The New Testament and The People of God; Jesus and The Victory of God, and.. The Resurrection of the Son of God. Myself, I still see Luther’s Simul Iustus et Peccator: Simultaneously Sinner & Saint as both brilliant theologically and pastorally! And I certainly stand with the Reformed theological: Christ’s active & passive obedience!